A worker takes a Huawei mobile Internet device next to it competitor ZTE Corp, left, which are displayed for sale at a computer mall in Beijing Wednesday, July 4, 2018. U.S. Republican lawmakers have dropped their efforts to reimpose a crippling ban on exports to the Chinese telecommunications giant ZTE. The move Friday gives a victory to U.S. President Donald Trump who has championed for ZTE to stay in business. Republican senators Friday dropped legislation that would block ZTE from buying component parts from the United States. Senators had included the legislation in a defense spending bill passed last month, but a House version of the defense bill did not include the same provision. Lawmakers say senators decided to leave the provision out of the final compromise bill, which is expected to come to a vote in the House and Senate in the coming days. Lawmakers from both parties have been critical of President Trump over his decision to lift a ban on U.S. companies selling to ZTE. U.S. Senate Minority Leader Chuck Schumer (D-NY) speaks to reporters at the Capitol as fallout continued over U.S. President Donald Trump's Helsinki summit with Russian President Vladimir Putin, in Washington, U.S., July 17, 2018. 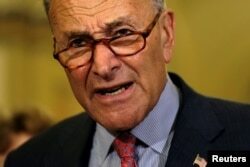 Top Senate Democrat Chuck Schumer blasted Friday's developments. “By stripping the Senate's tough ZTE sanctions provision from the defense bill, President Trump and the congressional Republicans who acted at his behest have once again made President Xi and the Chinese Government the big winners,” he said in a statement. Republican Senator Marco Rubio called dropping the provision “bad news” in a tweet Friday.ZTE is accused of selling sensitive technologies to Iran and North Korea, despite a U.S. trade embargo. In April, the U.S. Commerce Department barred ZTE from importing American components for its telecommunications products for the next seven years, practically putting the company out of business. However, Trump later announced a deal with ZTE in which the Chinese company would pay a $1 billion fine for its trade violations, as well as replace its entire management and board by the middle of July. The Commerce Department announced last week that it has formally lifted the ban on ZTE after the Chinese company complied with all terms of the settlement. Most of the world first heard of the dispute over ZTE in May after one of Trump’s tweets.